Private Preview | Friday June 15, 4 – 6 p.m.
Each Modern is pleased to announce an exhibition by the renowned Japanese photographer Moriyama Daido. The exhibition will be on view at Light Society, Beijing on June 16 and present Moriyama Daido’s lightboxes, Cibachrome, and video works, in China for the first time. In a famous article he wrote in the 1980s, Moriyama Daido mentioned, “Intervened by the memories, light enters the history. Then the history awakens the memories through the medium of light, that is how light exists in the ‘moment’. ” Light Comes Again focuses on the imaginative and provoking artist’s exploration of the relationships between medium, light, memory, and time. The exhibition is conceived by Daido Moriyama Photo Foundation and Each Modern. Defining photography as ‘a fossil of light and time’, Moriyama Daido’s lightboxes deeply react to the incontinuity of memories. The intense rendering imagery by lightbox also recalls the rapid change of social landscapes and medias in Japan from 70’s to present. “Not only I like my photographs printed for galleries and museums exhibitions, but also on photobooks, T-shirts, watches and posters to spread throughout the streets. I have been looking forward to see my photographs becoming lightboxes. Furthermore I will be very happy if they can blend into the streets as signboards in the future. The reason is that when photography becomes art, the possibilities are infinite. They are most powerful when they return to the circulation in society.” stated by Moriyama Daido. The exhibition includes 8 large-scale lightbox works featuring the most important images by the artist: <Accident(1969)>, <Yokosuka(1970)>, <Another Country in New York(1971)>, <Stray Dog, Misawa(1971)>, <Tights in Shimotakaido(1987)> and others. On the second floor of Light Society, <Hokkaido>, a black and white video plays as a loop, reminds the audience of Moriyama Daido’s shaking, blurry, out-of-focus style. Hokkaido is the starting point of Moriyama Daido’s photography and emotion. He desires the north since his childhood, and recognizes Tamoto Kenzo(1832-1912)’s photographs – an extensive documentary photographing project commissioned by the Hokkaido reclamation ambassador in the Meiji era – as a perfect status of photography: to fossilize the light and shadow. Due to the depression he experienced after the dismissal of the photography group ‘Provoke’, this northern island has always been the ’another country’ that Moriyama Daido wishes to escape to. The work was shot from 1972 to 1978, and it was published in 2009 and finalized in 2012. It echoes with his photographs printed in Cibachrome, a disappearing technology, in the 70s and 80s. So far, there are only two videos are made by Moriyama Daido: <Dog and Mesh tights>, collected by Fondation Cartier pour l’Art Contemporain, and <Hokkaido>, showed and collected by Tate. In 2013, Moriyama Daido had his early color photographs printed right before the last Cibachrome lab closed. It seems to be his grieve to the dying technology and the memory of scenes. Moriyama Daido’s color works continue his style in the black and white photographs. Just like the end of the memories, shaking and ambiguous, the odd colors present an intense insecurity. 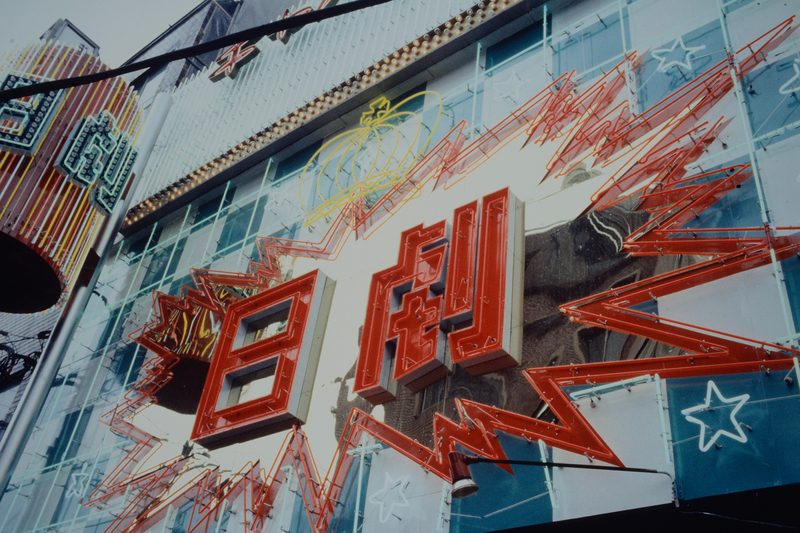 Cibachrome is a high-end positive-to-positive photo reproducing technology; its illusory and melancholic color tone significantly highlights Moriyama Daido’s photographs in a beautiful yet annihilating aspect. *about the Artist: Moriyama Daido(b.1938) is one of the most known and prolific Japanese photographers working today. His photographic style, described as grainy, blurry, out of focus, heightens the darkness and strangeness lurking below the surface of the urban landscape. He became a member of the influential collective Provoke in 1968 and kept on pushing the limits of photograph for more than five decades. His works has been widely exhibited and collected by prominent public institute, including the Museum of Modern Art, New York, the San Francisco Museum of Modern Art, The Metropolitan Museum of Art, New York. The Getty Museum, Los Angeles, The Museum of Fine Arts, Boston and The Centre Pompidou, Paris. Recent important retrospective includes Tate Modern(with William Klein, 2012), Fondation Cartier pour l’art contemporain(2016) and The National Museum of Art Osaka(2011). *about Light Society: Light Society is a photography center converges international resource, including education, research, exhibition, and collection.